Marshall, Tabitha. "Alex Stieda". The Canadian Encyclopedia, 10 October 2018, Historica Canada. https://www.thecanadianencyclopedia.ca/en/article/alex-stieda. Accessed 19 April 2019. Alex Stieda, cyclist, television commentator, columnist (born 13 April 1961 in Belleville, ON). In 1986, Canadian cyclist Alex Stieda became the first North American to wear the yellow jersey (or maillot jaune) in the Tour de France, as leader of the race. He also won a bronze medal in the individual pursuit (track cycling) at the 1982 Commonwealth Games and competed at the 1984 Olympic Summer Games in Los Angeles, California. 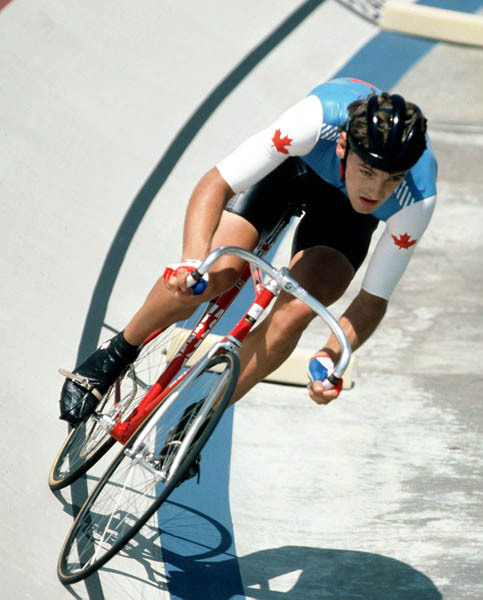 Canada's Alex Stieda competes in a track cycling event at the 1984 Summer Olympics in Los Angeles. Although Stieda loved hockey and other team sports (including soccer and volleyball), he also spent hours on his bicycle, whether as transportation to early morning hockey practices or on his paper route. “Being the first person on the road in the early morning was very special, with the city slowly waking up as I rumbled along with 50 heavy papers in my front carrier basket,” wrote Stieda in 2017. “I sometimes wonder how I kept that bike going with all that weight, up and down those hills with the little power that I developed back then!” With money saved from his paper route, he eventually bought and rebuilt a used 10-speed, riding it on several solo bike trips in the Gulf Islands. His parents supported his interest in cycling; both had positive memories of the sport, and Stieda’s maternal grandfather had been a member of the Chichester Wheelers Cycling Club in southern England. Stieda had grown frustrated with hockey by his mid-teens, complaining that he was spending too much time on the bench. Instead, he was encouraged to take up bicycle racing by local members of the BC Bicycling Association. He began racing in Vancouver when he was 16 years old, applying the power he had developed on the rink to track and road cycling. He quickly rose through the ranks of Canadian juniors track cycling, winning every single event (time trial, sprint, individual and team pursuits, omnium and the points race) at the junior national championships in 1979 and 1980. He also qualified for the 1979 junior world championships in Buenos Aires, Argentina, finishing fifth in the individual pursuit. Around that time, Canadians — and Americans — were beginning to make their mark in bicycle racing, which had long been considered a European sport. In the 1970s, when Stieda began cycling, Canadian Jocelyn Lovell won a silver medal at the world championships, as well as gold medals at the Commonwealth Games and Pan-American Games. 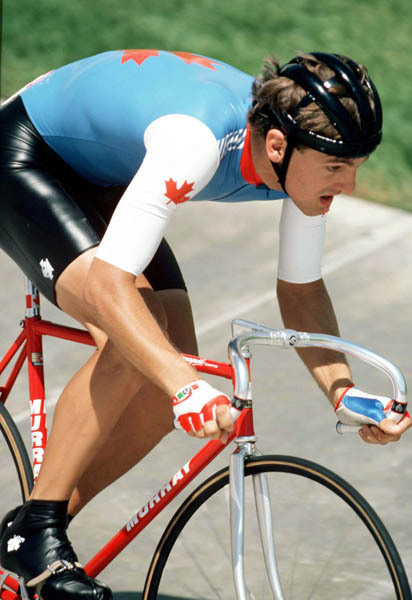 Fellow Canadian Gordon Singleton was one of the top sprint cyclists in the world and, in 1982, became the first Canadian to win a world championship in cycling. The same year, Stieda won a bronze medal in the individual pursuit at the 1982 Commonwealth Games in Brisbane, Australia, while teammate Steve Bauer won silver in the road race. Stieda also qualified for the 1984 Olympic Summer Games in Los Angeles, California, placing 10th in the points race and 14th in the individual pursuit in track cycling. Two of his teammates medalled at the 1984 Games. Bauer won silver in the individual road race, while Curt Harnett took silver in the 1,000m time trial in track cycling. 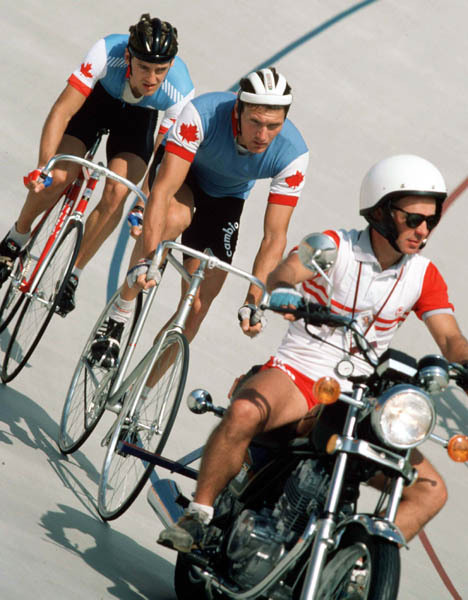 Canada's Alex Stieda (left) and Gary Trevisiol (centre) compete in the cycling event at the 1984 Summer Olympics in Los Angeles. 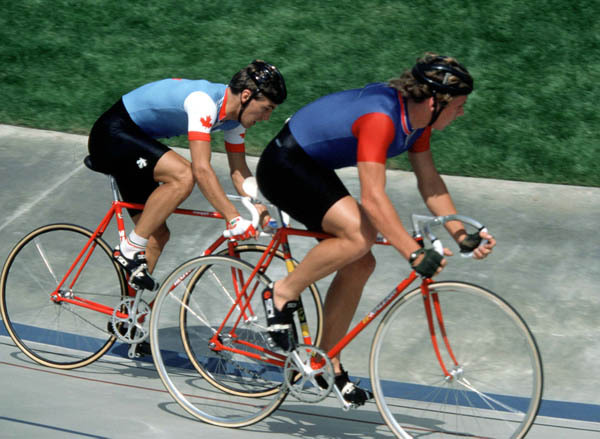 Canada's Alex Stieda (left) competes in a track cycling event at the 1984 Summer Olympics in Los Angeles. In 1982, Stieda started racing for the 7-Eleven cycling team, which would become one of the most successful American teams in cycling history. 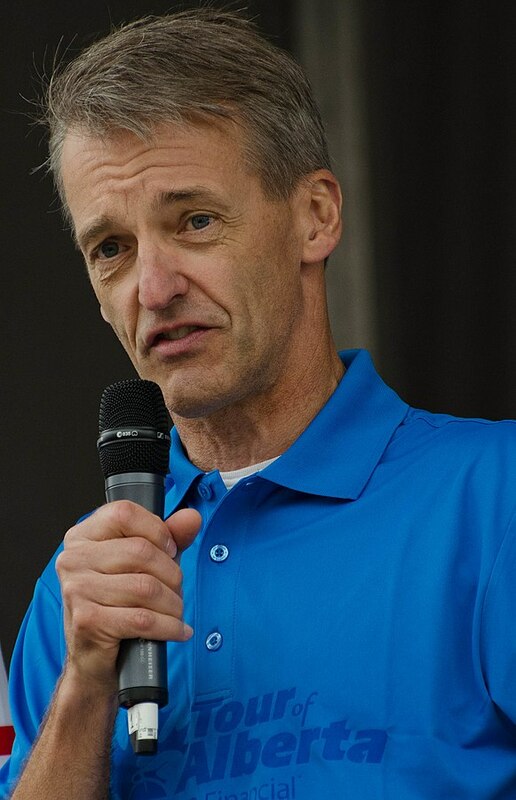 American Jim Ochowicz, a former Olympic cyclist, had founded the team a year earlier with captain Eric Heiden, who had turned to bicycle racing after a record-breaking career in speed skating. When Stieda joined Team 7-Eleven, it was composed entirely of amateur riders from the United States, except for Canadian professional cyclist Ron Hayman. The team would remain amateur until after the 1984 Olympic Summer Games, where seven members of the team won medals. In 1985, the 7-Eleven cycling team turned professional and began competing in European races, including the 1985 Giro d’Italia. Stieda turned professional the following year. In 1986, Team 7-Eleven became the first North American team to participate in the Tour de France, one of cycling’s most gruelling competitions. The annual Tour, which was founded in 1903, includes over 20 stages and is usually held over a period of about three weeks in July. The overall winner is the rider who completes the entire journey in the shortest time. The 1986 Tour de France began on 4 July with a 4.6 km prologue time trial in Boulogne-Billancourt. Stieda finished a respectable 21stin the time trial, the highest placed rider on the team. The following morning was the first full stage of the Tour, an 85 km ride from Nanterre to Sceaux. It was a short and relatively flat ride — a “classic North American–style race,” as Stieda later remarked. He broke away from the peloton (or main group) about 22 km into the ride, quickly gaining time. None of the European riders seemed concerned. “They thought we were all American jokers,” said Stieda. “I was out of sight, out of mind. Pretty soon I had three minutes, four minutes, five minutes.” The Canadian cyclist poured all his energy into his solo ride, picking up time bonuses along the way, and moving up the general classification (for overall time). He was eventually caught by a small group of riders and finished the stage in fifth place. Overall, however, he was now the leader of the race, which gave him the maillot jaune (yellow jersey). Stieda was the first North American to wear the yellow jersey. His performance also gave him the lead in other classifications, including best climber (polka dot jersey) and best young rider (white jersey). However, Stieda kept the yellow jersey for only a few hours. Exhausted by his performance in the first stage, he had a difficult time during the 56 km team time trial later that day. The 7-Eleven team as a whole did poorly, finishing 19th out of 21 teams after several crashes and punctures. Stieda had so little energy he was left behind by the team during the time trial, although two teammates remained with him, to help bring him in on time (riders had to finish within a certain time of the stage winners in order to avoid disqualification). By the end of the day, he was 5:10 behind the leading rider of the Tour and had dropped from 1st to 116th place in the general classification. However, he persisted over the following days and weeks. On 27 July, Stieda rode into Paris, France, finishing the 1986 Tour de France in 120th place. 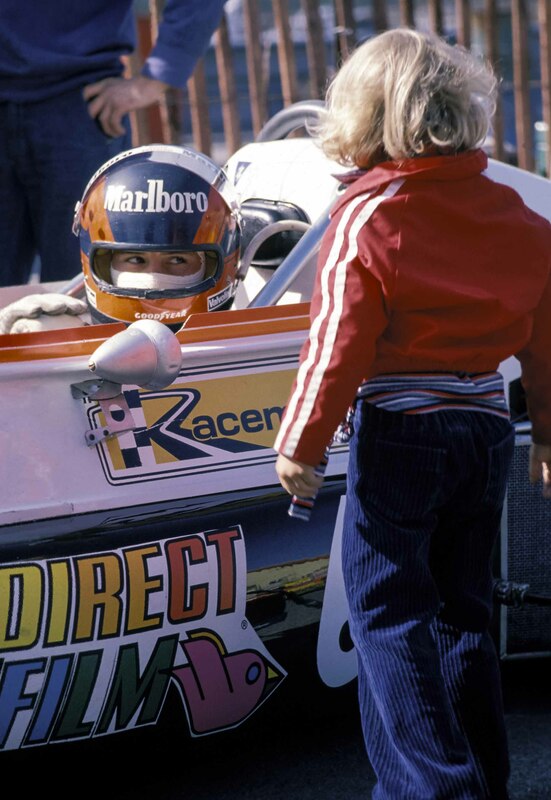 Stieda continued racing as a professional with Team 7-Eleven until 1990, winning races across North America. He moved to Evian-Miko in 1991 and then Coors Light in 1992, before retiring from professional cycling. Stieda has remained involved in cycling, coaching young riders through the Juventus Cycling Club and writing regular columns in Pedal, a Canadian cycling magazine. He has been a commentator on cycling for Sportsnet, OLN and the CBC, and he co-founded the Tour of Alberta, a professional cycling stage race. He also operated a bicycle touring company, Stieda Cycling, from 2004 to 2007. Between 2007 and 2018, he was an account executive in the information technology industry, and in June 2018 he founded Stieda Consulting. Stieda and his wife, Samantha, have two children, Kalie and AJ. He lives in Edmonton, Alberta. In addition to cycling, he is active in winter sports. Stieda has been involved with several charities, including Project Rwanda, Kids with Cancer, the Canadian Mental Health Association and the Heart and Stroke Foundation. As the first North American to wear the maillot jaune at the Tour de France, Stieda represented a new era in international bicycle racing. Cycling had long been considered a European sport, but North American riders were making their mark on the international stage. Although Stieda only briefly wore the famed yellow jersey at the 1986 Tour de France, American Greg LeMond finished on top of the podium that year, the first of his three victories. Two years later, Steve Bauer became the first Canadian to win a stage at the Tour de France and finished fourth overall. The next best finish for Canadians came in 2010, when Ryder Hesjedal	placed sixth (Hesjedal won the Giro d’Italia in 2012, becoming the first Canadian to win a Grand Tour). Since Stieda’s historic donning of the yellow jersey, Canadian men and women have excelled in many cycling disciplines, including road, track, and mountain biking. This includes medal-winning performances at the world championships, Olympic Summer Games, Commonwealth Games	and Pan American Games.